Want to learn how to use tidycensus? 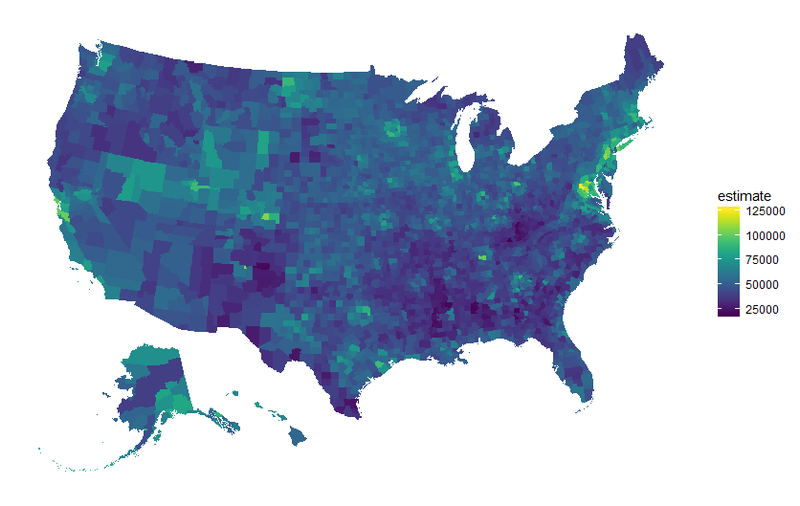 Take the DataCamp course Analyzing US Census Data in R! get_acs() now defaults to the 2013-2017 five-year American Community Survey estimates, or the 2017 1-year estimates if users set survey = "acs1". tidycensus now includes support for the Census Bureau Population Estimates API. Please see https://walkerke.github.io/tidycensus/articles/other-datasets.html for examples of how to use these new features. Important internal changes to ensure that tidycensus continues to work with upcoming changes to Census API endpoints. Several internal improvements and bug fixes. Please see the closed issues at https://github.com/walkerke/tidycensus/issues for a list. A new parameter, shift_geo, allows tidycensus users to get US state and county geometry originally obtained with the albersusa R package with Alaska and Hawaii shifted and re-scaled for better cartographic display of the entire US. My work heavily involves the use of data from the US Census Bureau, and like many R users, I do most of my work within the tidyverse. Beyond this, the sf package now allows R users to work with spatial data in an integrated way with tidyverse tools, and updates to the tigris package provide access to Census boundary data as sf objects. Recently, I've found myself writing the same routines over and over to get Census data ready for use with tidyverse packages and sf. This motivated me to wrap these functions in a package and open-source in case other R users find them useful. To keep up with on-going development of tidycensus and get even more examples of how to use the package, subscribe to my email list by clicking here (no spam, I promise!). You'll also get updates on the development of my upcoming book with CRC Press, Analyzing the US Census with R.
You can also follow my blog at https://walkerke.github.io. My development focus is on making the current datasets as accessible as possible; if you need other approaches or datasets, I recommend the censusapi and acs packages. Hiring me as a consultant to help you use tidycensus in your project, or hiring me to give a workshop on tidycensus for your organization. Please contact me at [email protected] if you are interested! Filing an issue - or even better, a pull request - at https://github.com/walkerke/tidycensus/issues. Note: This product uses the Census Bureau Data API but is not endorsed or certified by the Census Bureau.